Much of this is second-hand information - irritatingly, Star Trek : The Magazine has never been on sale in the UK (and I can't find anybody who will export them), and I can't afford the Fact Files. So if you come across any errors here, let me know via the email link below. 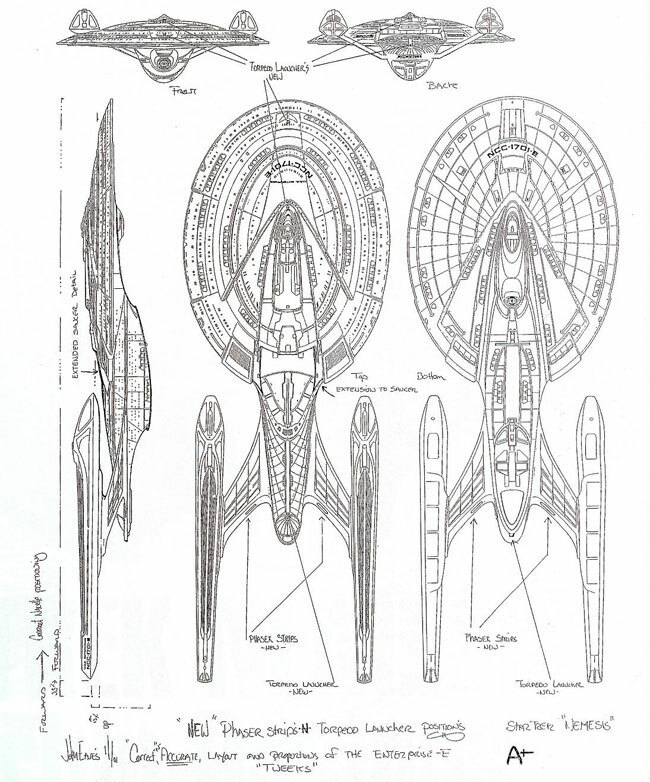 Special thanks to Gerard Gilso for permission to modify and use his blueprints of the Sovereign class and to Prometheus for the scans of the images from Star Trek : The Magazine. Other shots are taken from the VHS or DVD copies of the relevant movies. Eaves : "I wanted a sleek, very fast ship with favourite elements from all the starships that had gone before, especially Bill George's Excelsior. Everyone knows the basic shape; the saucer section, the body, the two nacelles. They've been arranged so many times in so many beautiful ways, I thought 'well how will I approach this?'. I decided to start with a really sleek design. While all of the Enterprises were beautiful, none of them had a really streamlined, 'warp speed' look. We have the 'cadillacs' of starships; I wanted a porsche." The Sovereign certainly looks sleek and fast as hell - we don't have any idea of the ship's top speed but I tend to rate it as one of the fastest in the fleet. This would give it a top speed well above warp 9.9 range, to match the Warp 9.975 maximum cruise speed of the Intrepid class. The ship is fitted with 196 escape pods. These were of a new design with a near-triangular hatch cover rather than the older square hatches used on the Galaxy class. The same hatches were used on all of the new ships designed for First Contact. 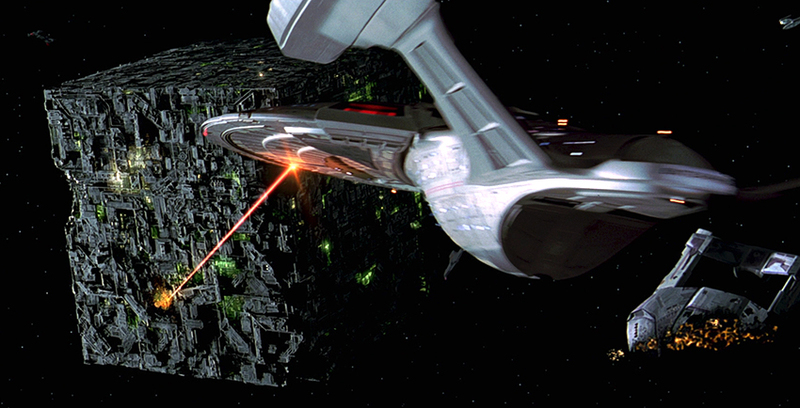 The Enterprise-E pods were used in First Contact, to evacuate the crew to an island on Earth. Presumably either the pods are capable of returning to orbit and re-docking with the ship, or the ship beamed them back into space and tractored them back to their places when we weren't looking. 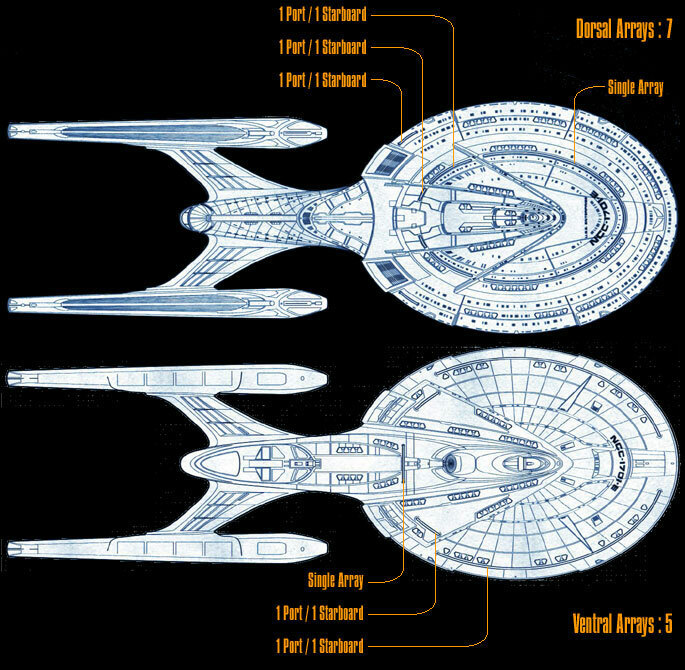 There are 24 decks on the Enterprise-E, according to Picard in "First Contact". However, the same movie features a reference to deck 26 and Nemesis contains a reference to deck 29! The ship schematic on the bridge shows 24 decks to be the correct figure, so something funny has presumably gone on with the deck numbering system somewhere. 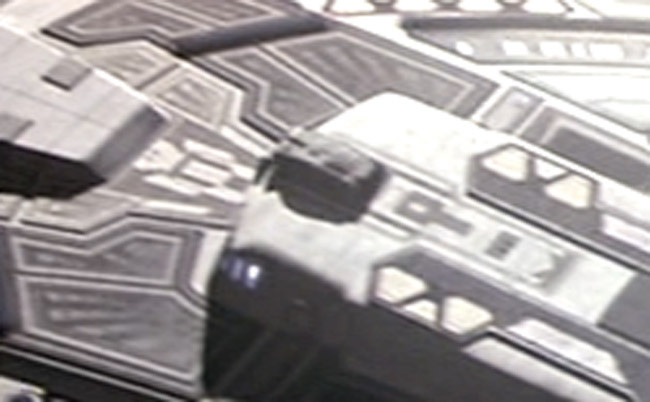 If you look at the nacelle pylons, you can see that in the newer version of the ship they have been moved forwards. The shape of the pylons has also changed slightly, making them a little narrower at the engineering hull end. The nacelles themselves seem to have moved forward with the pylons, reducing the length of the ship by about twelve metres. Additionally, there is a slight change to the base of the engineering hull. The point at which the "cutout" portion on the hull begins has been moved back by about seven metres, allowing the hull to curve upwards slightly. 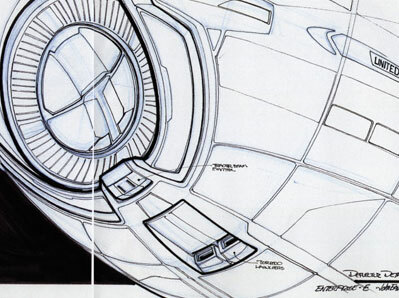 The aft-facing tractor beam emitters seen in the drawings for the original ship are now visible here. There is also a change to the way that the saucer connects to the engineering hull - the fairings on either side of the main shuttle bay have been given a slightly more streamlined look. You can see this much more clearly on one of the production drawings later in this article. I've seen it said that the makers of Trek intend that the Nemesis version of the Sovereign is the way it looked all along. But I don't see the need to assume this. Although not canon, it has long been suggested that the shape of a Starship hull is dictated by the shape of the warp field - hence the ships are becoming more "streamlined" over the years as their designers develop flatter, more efficient warp fields. So the structural changes may reflect a faster or more efficient warp drive system which the ship has received. 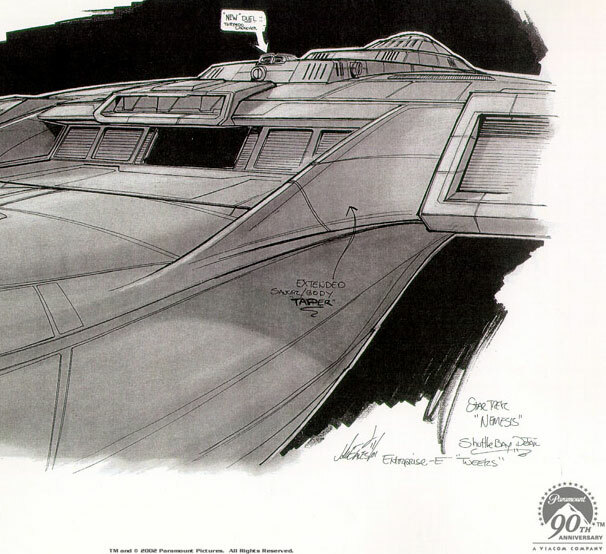 As we will see in the rest of this article, the ship's weaponry was also uprated for Nemesis. Given that the Federation has just been through a major war, it only makes sense that Starfleet would have upgraded its ships significantly. As far as phasers are concerned, the Sovereign was originally quite impressively equipped in some areas but less so in others. On this diagram I have marked the ship's phaser arrays as seen in First Contact and Insurrection. As you can see, there is extensive phaser coverage for the area above and behind the ship - no less than six arrays cover this area! The forward area is also well covered, with the three longest arrays and the engineering dorsal array able to fire forwards. The weakest coverage is below and aft - only the ventral engineering array can come close to reaching this spot, and although it is hard to judge properly from diagrams, it appears that there is a sizeable blind area to the rear of the ship. It's worth noting, though, that anybody who was in this blind spot would be directly in the sights of the two aft facing photon torpedo tubes. 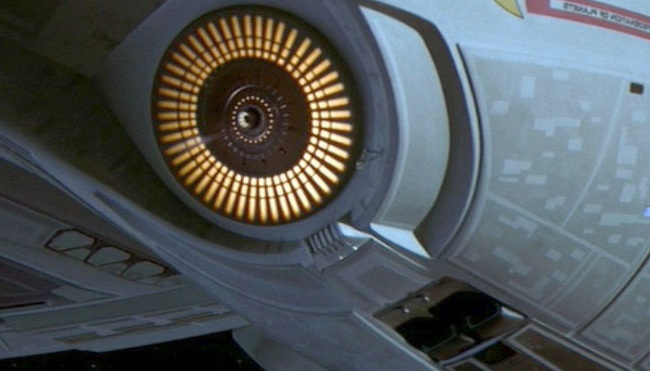 The main dorsal saucer array in "First Contact"
The port main ventral saucer array in the same movie. 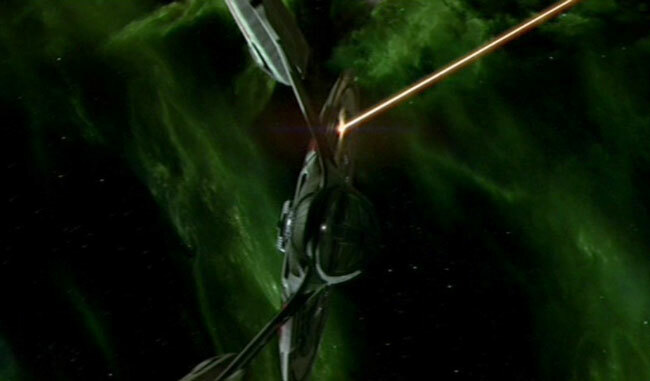 The ventral Engineering hull array firing in "Insurrection". 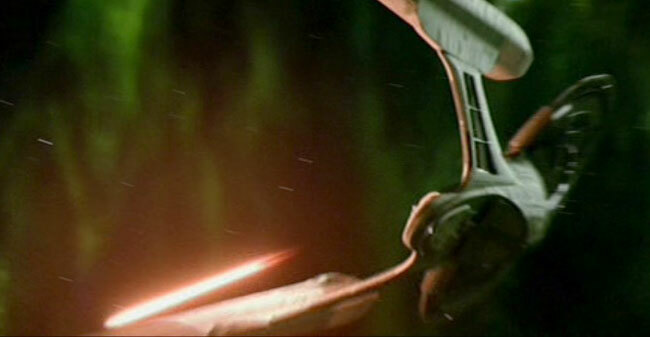 The starboard secondary ventral saucer array firing in Nemesis. These weapons nicely fill in the "blind spot" described above, and give the Sovereign the same level of all-around phaser coverage that the Galaxy class enjoys. At least one official publication - the cutaway poster published around the time of First Contact - claims that the phaser arrays on the Sovereign are Type XII, directing 7.2 MegaWatts per emitter segment compared to 5.1 MegaWatts per emitter for the Type X arrays used on the Galaxy class. Discussion of what a Type XII array might be, and reasons why these emitter power ratings are out of line with Trek canon, are given in my phaser phaser article. The same poster claims a crew complement of 700 for the Sovereign. It's not known if this includes family members, though the fact that no civilians have ever been seen on board the Enterprise-E and that nobody has ever worried about civilians when a battle was in the offing, as they often did on the Galaxy class Enterprise-D, argues against it. 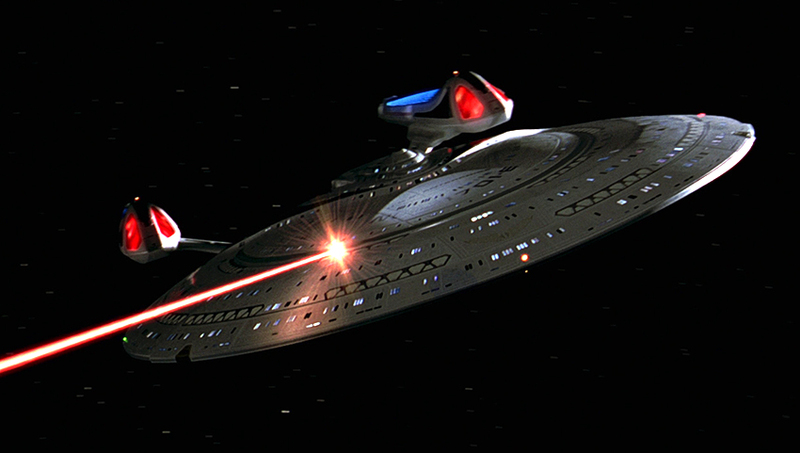 The Enterprise-E fires her quantum tube. The Enterprise-E was only the second Starfleet ship seen to use the quantum torpedo, the first of course being the USS Defiant. 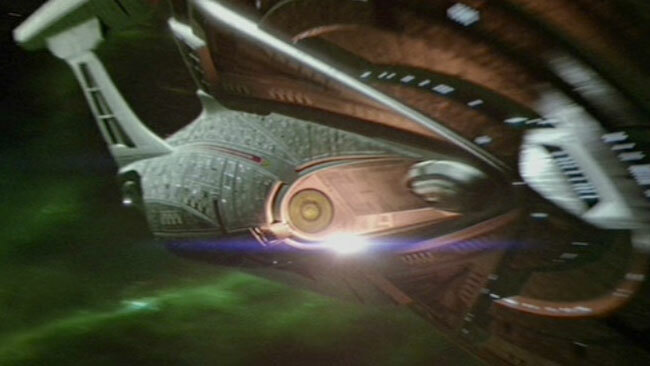 It is not known what advantage quantum torpedoes have over photons - the DS9 Tech Manual suggests that the quantums have a greater yield, but this is not stated in canon and the true advantage may lie in range, agility, ability to penetrate shields, or some other area. The thing directly below the deflector dish is a tractor beam emitter, according to the drawing above. The twin tubes are clearly visible behind, and you can just make out a little of the ventral engineering phaser array in the bottom left corner of the picture. Neither these tubes nor the tractor beam emitter are visible in First Contact or Insurrection, but the tubes are seen firing in Nemesis. This gave the ship no less than five torpedo tubes, which was pretty impressive. Rick Sternbach, who created many ship designs for Star Trek and did much of the work on filling in the technical details for the series, suggested that each of these tubes could fire twelve photon torpedoes simultaneously, compared to ten at a time for each of the three tubes (two visible, one hidden while the saucer was docked) of the Galaxy class. There was even more to come. The Star Trek Fact Files is one of those magazines where you buy a binder and a small insert is published periodically, building up into a big encyclopedia-style book. I don't collect them myself, but I have been told that the Fact Files suggested that the ship carried two more quantum torpedo tubes flanking the secondary deflector on the saucer section. These tubes have never been seen in action and are not visible on the model, so far as I can discern. Since the Fact Files were somewhat inaccurate, at least in early editions, I tend to discount the existence of these weapons. As you can see, the top two diagrams show a single torpedo tube above the aft shuttle bay, plus two more behind the bridge. The bottom one shows those plus another tube below the aft shuttle bay, another forward of the bridge, and another near the leading edge of the saucer. This diagram also shows the extra phaser arrays on the nacelle pylons. The angle makes it a little difficult to tell if this torpedo comes from the tube above the shuttle or one of the pair behind the bridge, but if you trace back along the direction of travel then this torp is a perfect match for something originating from above the aft shuttle bay. So we can be pretty confident in declaring that this tube is canonical. If we were to assume that the aft tube was installed by the time of Insurrection, we would be faced with the fact that there were two refits - one after First Contact, one after Insurrection. This seems undesirable to me, and given that there is no real necessity for it I prefer to believe that all of the extra tubes were installed after Insurrection. 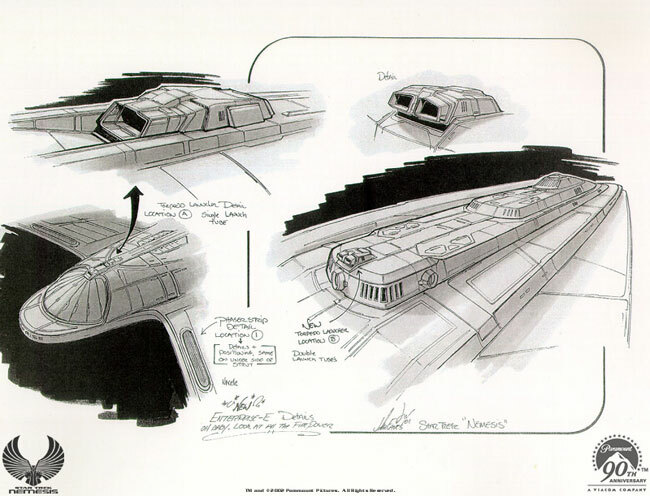 As we can see in the third of the Nemesis production drawings, there is one tube left to deal with - that below the aft shuttle bay. This is not seen firing in any movie, and a close examination of the area during Nemesis does not show it on the model - though our view of this area is not a very good one so it's hard to be sure. Some of these new tubes are of a rather strange design. Most torpedo tubes are much longer than a torpedo. They sit buried within the hull, with only the muzzle pointing out into space. This gives plenty of room for the torpedo to accelerate to launching velocity, and plenty of room for associated machinery behind and around the tube which can load and fire the it. However, these new tubes are extremely short, barely longer than a torpedo casing. So there is little room for a torpedo tube to accelerate. They are also sitting on the surface of the hull, making them very difficult to reload from behind. It's possible that they are reloaded from below, but even this would be difficult for the aft facing tubes. The twin tubes are located directly above a docking port, so it is hard to see how there could be any kind of reloading mechanism directly below the tube. The single tube is little better, since it sits directly above the aft hangar bay. There may be some sort of "pop up" reloading mechanism that loads the tubes from behind, though even this would be hard for the one located above the hangar bay. Or perhaps torpedoes are beamed into the tubes, or replicated within them - farfetched, but within the realms of Star Trek technology. Single Quantum Ventral saucer, beneath captain's yacht Observed firing in First Contact, Nemesis. Single Quantum Ventral saucer, port of secondary deflector Reported in Fact Files. Existence unlikely. Single Quantum Ventral saucer, starboard of secondary deflector Reported in Fact Files. Existence unlikely. Twin Photon Ventral engineering hull, forward Observed firing in Nemesis. Twin Photon Ventral engineering hull, aft Observed firing in Nemesis. Single Photon Dorsal engineering, above aft hangar Observed on production drawings for Insurrection. Possibly seen firing in Nemesis. Twin Photon Dorsal saucer, aft of bridge Observed firing in Nemesis. Uncertain Photon Dorsal saucer, forward of bridge Observed on model in Nemesis. Uncertain Photon Dorsal saucer, near forward edge Not seen on model; existence unlikely. Uncertain Photon Ventral engineering, below aft hangar Not seen on model; existence unlikely. If we took all these tubes to exist, and all the uncertains to be twin tubes, the Sovereign would have no less than sixteen torpedo tubes! If every one of them could fire twelve torpedoes at a time, as Rick Sternbach suggested for the original four photon tubes, then with a single volley the Sovereign could launch 192 torpedoes. Single Photon Dorsal engineering, above aft hangar Observed firing in Nemesis. Single Photon Dorsal saucer, forward of bridge Observed on model in Nemesis. Or one quantum and eight photon tubes in total. This would leave us with a salvo of 108 torpedoes, which still seems excessive. It's easy enough to cut this number down some. The quantum tube has never been seen to fire more than one torpedo at once; while Sternbach's suggestion of a 12-torp burst fire capacity should be held as official for the four tubes at the bottom of the engineering hull, given the small size of the other tubes I would suggest that they cannot have this capacity. At the start of the Nemesis battle we see the twin tube aft of the bridge fire two groups of three torpedoes, suggesting that these tubes can hold and fire three at a time. This would allow the ship to fire "only" 37 torpedoes at a time, which is rather more sensible. Photon torpedoes are relatively small objects - the TNG Tech Manual states that the casing measures 2.1 x 0.76 x 0.45 metres, and although that book is not canon the torpedo casings seen on the screen seem a close match for these figures. Even a basketball court could comfortably hold 120 torpedoes laid out on the floor - and this is leaving plenty of room to actually get at the torps and move them around. Stack them 5 deep, which you could do in a normal deck height, and you could easily fit 600 photon casings on a basketball court. There is certainly enough space on the Sovereign to carry ten or twenty thousand torpedoes, then. However, this does seem a little excessive. 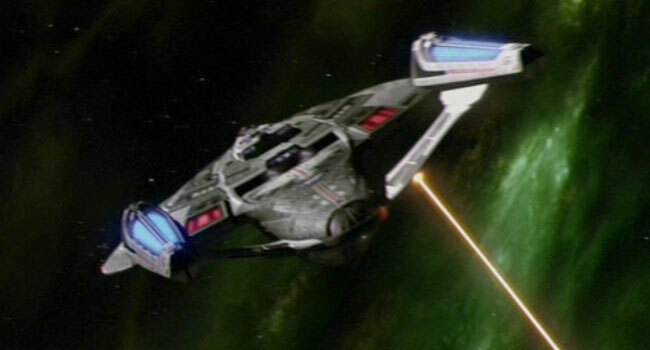 The much bigger Galaxy class only carried around 250 torpedoes, and even Deep Space Nine held only five thousand torps. Even if the Sovereign is a more "militarised" design than the Galaxy it doesn't seem likely that the total complement would be higher than five or six hundred. This would allow the Sovereign to get through all of its torpedoes in about twenty salvos, which is about right. The Sovereign certainly represents one of the most formidably armed Starfleet vessels to date. Indeed its armament approaches - some would say exceeds - the limit of sensible design and story credibility. Nemesis shows that the ship can also survive immense damage. The ramming of the Scimitar did major structural harm to the Enterprise-E on top of the battle damage yet the ship was largely repaired before Riker had even left for the Titan command, indicating a timeframe of days or weeks rather than months. The combination of a heavy offensive punch and damage resistance confirm this Sovereign as one of Starfleet's finest and most powerful vessels.